President Carter signaled that he wanted more women appointed to executive branch positions during his administration. He created an Advisory Group on Women inside the White House, and sought the names of qualified women candidates for open federal positions. Although women had been present at the creation of the SEC, gaining in its formative years the reputation of a place where women would be welcomed as employees, for over forty years no woman had served as a member of the Commission. 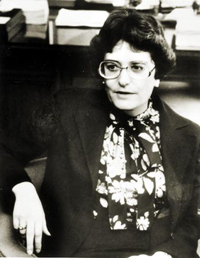 In 1977, when President Carter was looking for a female New York lawyer to appoint to a vacant seat on the Commission, Roberta Karmel seemed a perfect choice. Karmel had graduated from New York University School of Law in 1962 as one of the top five of her class. Unable to obtain a job in several firms to which she applied—"We have already hired a woman," one hiring lawyer told her - she decided to apply at the SEC's New York Regional Office. At the time of her SEC appointment, Karmel was in private securities practice with the firm of Rogers and Wells. SEC Chairman Williams, when asked about the potential of the first woman Commissioner said that his "primary objective is that the nominee be an individual with a strong securities background… and while delighted to have a woman on the commission, he cares more about the individual's qualifications for the job. "(60) Carter personally interviewed her, asking if "she was strong enough for the job?" Both President Carter and Chairman Williams made it clear that her job would be "to constrain an enforcement staff that to many in the private sector was out of control."